1. 1 PROMOTION PERIOD: The entry period for the “Intermedia Hawaii Vacation Sweepstakes” (“Sweepstakes”) begins on April 18, 2016 at 12:01 a.m. Pacific Time and ends on December 31, 2016 at 11:59 p.m. Pacific Time (the “Sweepstakes Period”). Winner will be randomly selected during the first week of January 2017 after the Sweepstakes Period from all eligible entries as more fully set forth below. By participating in the Sweepstakes, each entrant unconditionally accepts and agrees to comply with and abide by these Official Sweepstakes Rules and the decisions of Intermedia.net, Inc. ("Intermedia"), which shall be final and binding in all respects. 1.2 ELIGIBILITY: Open only to entrants who are legal residents of the United States (excluding residents of locations where sweepstakes are restricted or not permitted), and who are 18 years of age or older as of date of entry. The Sweepstakes is void where prohibited by law. 1.3 HOW TO ENTER: In order to enter the Sweepstakes, an entrant must (a) attend a conference, trade show or similar event at which Intermedia has a presentation booth and is offering participation in the Sweepstakes (as evidenced by the presence of Sweepstakes-related posters and/or entry collection bins) and (b) provide Intermedia with his or her business card with entrant’s contact information or, where applicable, allow Intermedia to scan his or her conference badge and thereby obtain entrant’s contact information . Please note that, by providing Intermedia with your business card or allowing Intermedia to scan your conference badge (in either case as an entry in the Sweepstakes), you are consenting to having Intermedia contact you to discuss your potential interest in purchasing Intermedia products or services. If you do not wish to hear from Intermedia, simply do not enter the Sweepstakes. 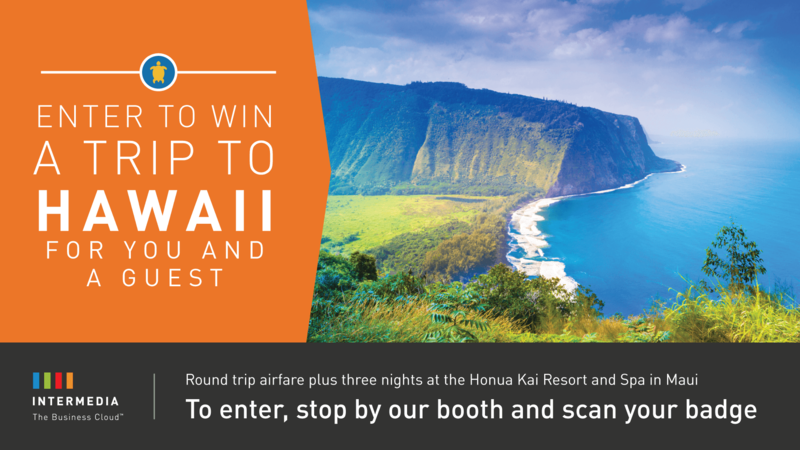 1.4 PRIZE and ODDS: Grand Prize – One (1) prize winner (“Winner”) will be selected at random from all eligible entries and will receive a four (4) day / three (3) night trip to Maui, Hawaii for Winner and one (1) guest (“Guest”) at Honua Kai Resort and Spa, consisting of the following: [a] hotel accommodations (one (1) standard double occupancy bedroom or studio, including room tax) for three (3) consecutive nights; [b] two (2) round-trip coach air transportation (with possible layovers) on an Intermedia-selected carrier between an Intermedia-selected major metropolitan airport near Winner’s residence (“Airport of Origin”) and Kahului Airport; and [c] round trip ground transportation between (i) Winner’s residence and the Airport of Origin and (ii) Kahului Airport and the Honua Kai Resort and Spa, on an Intermedia-selected shuttle service (the “Trip”). The Approximate Retail Value (“ARV”) of the Trip is $3,500.00 USD, which will vary depending upon point of departure and seasonal fluctuation of hotel rates and airfares. 1.5 WINNER SELECTION AND NOTIFICATION: The Winner will be selected at random during the first week of January 2017 after the end of the Sweepstakes Period from all eligible entries. Intermedia shall have no liability for any Winner notification that is lost, intercepted or not received by the potential winner for any reason. If, despite reasonable efforts, a potential winner does not respond as directed within five (5) days following the first notification attempt, such potential winner will forfeit his or her prize and an alternate winner may be selected, in Intermedia’s sole discretion, in a random drawing from among the remaining eligible entries. If necessary, Intermedia will successively attempt to contact up to two (2) potential alternate winners of the Prize in accordance with such procedure, and if there is still no confirmed winner of the Prize in question after such attempts have been made, the Prize may go un-awarded. If any potential winner is found to be ineligible, or if he or she has not complied with these Official Sweepstakes Rules or declines a Prize for any reason prior to award, such potential winner will be disqualified and an alternate winner may be selected in the manner described above. 1.6 GENERAL RELEASE: By participating, each entrant agrees that Intermedia, its parent, subsidiary and affiliated companies, licensees and assigns and their respective officers, directors, employees, agents and representatives, shall not be responsible or liable for any losses, damages or injuries of any kind resulting from participation in the Sweepstakes, or from entrants’ acceptance, receipt, possession and/or use or misuse of the Prize. Intermedia assumes no responsibility for any lost, interrupted, or unavailable network, server, scanner, scanner connections; or for any miscommunications, failed computer scans, satellite, cable transmissions, and technical errors related to a computer system, phone line, hardware, scanner, software or program malfunctions, or other errors, failures, delayed computer transmissions or network connections that are human or technical in nature. Without limiting the generality of the foregoing, Intermedia is not responsible for illegible, misdirected, misprinted, late, lost, damaged, improperly accessed, inaccurate, incomplete, misrouted, multiple, non-delivered, or stolen entries or prize notifications. By accepting the Prize, Winner acknowledges that Intermedia has neither made, nor is in any manner responsible or liable for, any warranty, representation or guarantee, express or implied, in fact or in law, relative to the Prize, including but not limited to its quality or fitness for a particular purpose. In the event of a dispute as to the identity of the entrant, an entry will be deemed submitted by the authorized name on the business card. Only the type and quantity of the Prize described in these Official Sweepstakes Rules will be awarded. The invalidity or unenforceability of any provision of these Official Sweepstakes Rules shall not affect the validity or enforceability of any other provision. In the event that any provision is determined to be invalid or otherwise unenforceable or illegal, these Official Sweepstakes Rules shall otherwise remain in effect and shall be construed in accordance with their terms as if the invalid or illegal provision were not contained herein.